19 November 2001 - The 9th Chinese National Games in Guangzhou have proven to be different than the two earlier versions in Beijing 1993 and Shanghai 1997. 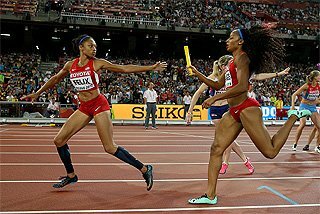 The quality of the women’s distance running in these games is not similar to those previous World Record breaking meetings. Ma’s Family Army is still winning most events, but with lower results. 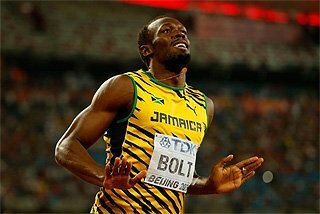 Before the meeting Ma promised that Liaoning Province will take all 11 available golds for middle and long distance running. After 7 events out of the 11 have been contested, Ma has 5 golds, with his athletes failing to win the men’s 1500 m and 3000 m steeple. What has changed? Shang Xiutang, General Secretary of China AA, said quite frankly in an interview that “doping-control is much stronger now”. 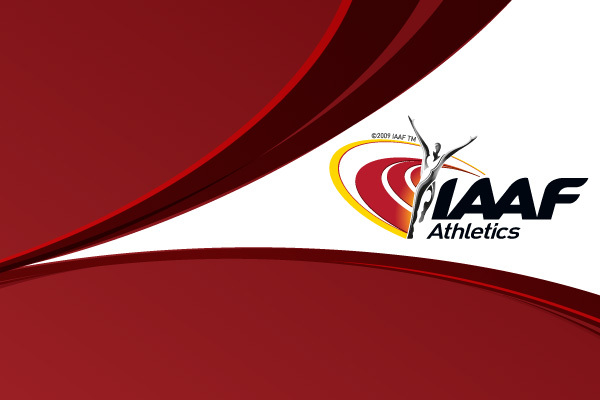 There has been EPO-testing in Guangzhou during the competition and also out-of-competition tests have been made for athletes before the competition started on 17 November. 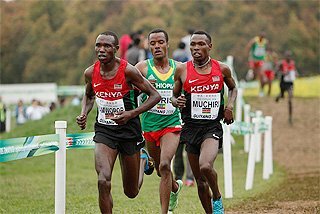 Other teams with distance runners were furious after Ma’s Army took both Marathon races in Beijing in October, as there was no blood testing available there. In the women’s 1500m the audience also saw a very different Chinese National Games final - a tactical race. 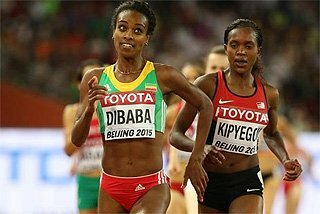 For the first 500 metres the pack was almost walking before Dong Yanmei, 4th in the World Championships 5000m this year, took the lead. After 800 metres, Dong finally made her move and with quick acceleration she suddenly had a 30-metre-lead. However, Dong did not last until the finish line as newcomer, 23-year-old Army contestant Liu Xiaoping, coming to the National Games only with a personal best of 4:16.04, passed Dong easily in the start of the final straight. But Ma’s Army did not surrender with Dong as it finally was 21-year-old Lin Na who won the competition overtaking Liu just before the finish line. Just an 800m runner before this season, Lin was 3rd in the 1997 National Games 800m with 1:58.16. The next day Dong Yanmei came back and won easily the 10,000m. This time she took up the pace from the start and was never challenged. The tightest competition until now was the men’s 100m where teammates Yin Hanzhao and Liu Yang, both from Guangdong, raced to the line in the same time. Yin was finally given the victory with both given the same result 10.25. The fastest Chinese this year, Chen Haijian (10.20), was absent from the race because of an injury. Other winners included 20-year-old Xu Zizhou (Guangdong), who earlier this year broke teammate Han Chaoming’s National Record in the East Asian Games (45.25), a clear winner in the 400m. Already second as a 16-year-old in the 1997 Games, Xu now took his first gold of the meeting with no real competition, mainly because Han now specialises in the 200m. Xu, winning with 45.74, is running in both relays, where Guangdong team is tipped to win, and in the 200m where he he will attempt to secure his fourth gold. Xu already ran 20.39 in the World University Games semifinals, but with too much wind assistance - he will surely go after Han’s 5-year-old National Record of 20.54 in the 200m competition later this week. Gong Ke, first double winner of these National Games, took the slow 10,000 m with his fast kick in the end. Gong, another member of Ma’s Army, already won the Beijing International Marathon, a part of the National Games, a month ago. Sun Wenli (Shandong), 3rd in the National Games 1997, won the steeplechase with 8:36.25. Sun has ruled the event in China since the 1997 Games and with 1997 winner and National Record holder Sun Ripeng (Ma’s Army) dropping out of the final in the heats and 2nd Li Changzhong finishing last in the final (12th), Sun took the title in a sprint finish from Sun Jiawei (8:38.85). 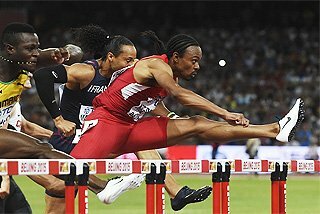 The best world class action was offered in the men’s 110m hurdles. 18-year-old Liu Xiang, who won the World University Games in Beijing and advanced to the semifinals in the World Championships in Edmonton, showed that despite his young age, he can win here too. Falling 0.11 short of the famous Li Tong’s National Record of 13.25 from 1994, Liu won with 13.36 - 0.04 off the Asian Junior Record he recorded in May. 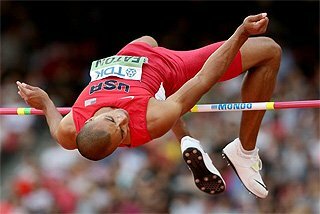 Veteran hurdler, 29-year-old Chen Yanhao, winner in the 1997 Games before Li Tong, was left in 2nd place with 13.42. Chen bettered his personal best earlier this season for the first time in seven years (13.37). Third was another junior, 17-year-old Shi Dongpeng in 13.49, falling 0.06 off his own World all-time best for 17-year-olds. 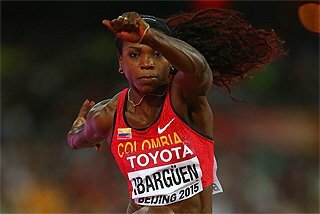 Both men’s and women’s long jumps were ruined by poor conditions. Li Dalong, expected to break the Asian Record of 8.40m in this competition, was unable to overcome the strong headwind and only jumped 7.95m with his first try, enough for a win. The headwind was even stronger during the women’s final and with the best Chinese jumper during the last few years, Guan Yingnan (9th in Edmonton), quitting the field due to an injury after her first jump, the gold medal went to Gu Ying with only a distance of 6.57m. In the men’s javelin, the competition was tougher than expected. Li Rongxiang, 29-year-old thrower, who has been reigning the event in China since 1998, was challenged by Zhang Lianbiao, former National Record holder. Zhang, who lost his NR (83.32), which he threw winning the 1994 Asian Games, started with his first 80-metre-throw in 5-years - 80.72. Li was only able to answer with he 3rd throw of 81.15m, but that was enough to give him gold. In the women’s sprinting events, the 1997 level was also nowhere at sight, even though the first two places replicated the 1997 result: Sichuan runners Li Xuemei, Asian Record holder in both 100m & 200 m and Liu Xiaomei boosted past Chen Yueqin (Hainan) in the final 20 metres. Li won with 11.14 with Liu in second (11.22), both recording seasonal bests. Li Xuemei, who has been struggling with injuries ever since her great results in Shanghai 1997 said that she is hoping for better results in the 200m later. The 400m was won in 51.35 by Bu Fanfang bettering her personal best of 51.85 from 1997 National Games, then enough for fifth place. In a close race, Chen Yuxiang took another 2nd place in the meeting (also 1997) with 51.40. The women’s 100m hurdles final was a fast race, but the results were spoilt by an illegal wind of +2.2 m/s. Su Yiping won the race with 12.70, 2nd fastest Chinese all-time in all conditions. She said that winning the 2002 Asian Games is her next goal. National Record holder Zhang Yu (12.64 in 1993 NG) made a comeback as a 30-year-old, now finishing fourth with 13.03. 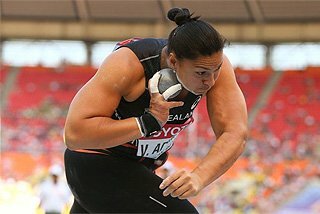 The women’s discus competition saw the usual deep strength of the Chinese women’s throws. However, the winning result was only 62.34 by Song Aimin, with just 14 cm separating the three places on the podium! Shen Shengfei, also troubled with injuries lately, showed that she can still finish a Heptathlon: 6263 points for a personal best moves her to 3rd Chinese all-time. 20-year-old Shen already took 2nd place in the 1997 Games when she was just 16! Also her previous personal best of 6185, the standing Asian Junior Record, was from the same meet. Shen won quite easily after another favourite, Liaoning athlete Du Xueru, 18, was unable to finish the competition due to an injury. However, probably the best competition so far has been in the walking events with the women's 20km walk offering the highest quality of competition in the first three days. Liaoning walkers Wang Yan, Sydney Olympic Champion Wang Liping and Liu Hongyu entered the stadium almost simultaneously with the two Wangs in the front. In the end it was 30-year-old Wang Yan who won from the Sydney winner Wang Liping in an Asian Record of 1:26:22. 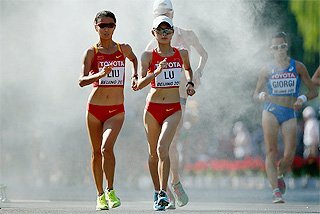 Wang Liping's time was only a second slower, 1:26:23 and also Liu, former Asian Record holder (1:27:30 in 1995) bettered her personal best with 1:26:35. In fourth place was another Liaoning athlete, 18-year-old Jian Xingli, who walked to an Asian Junior Record 1:29:31. The men's 20km walk was won by Li Zewen 1:20:49. 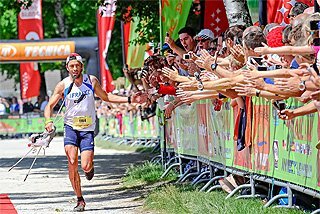 This was the second consecutive victory for Li who also won in Shanghai 1997 with almost identical time of 1:20:45. 19-year-old Pei Chuang took second place with his pb of 1:20:58. Li Zewen has also been entered to 50km walk next Friday, a distance he has never covered before. The 9th National Games are now at halfway point with Tuesday, 20 November, being a rest day. 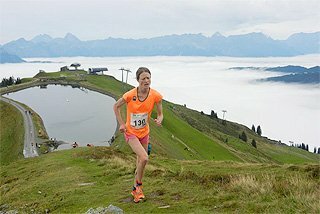 Rest of the competition runs from 21-23 November. 100 m (+0.5): 1 Yin Hanzhao 10.25; 2 Liu Yang 10.25; 3 Wang Peng 10.28; 4 Liu Dapeng (83) 10.33; 5 Chiang Wai Hung HKG 10.40. 400 m: 1 Xu Zizhou 45.72 (46.45 1h1); 2 Jiang Bo 46.54 (46.03 1h2); 3 You Hanshan 46.98 (46.65 2h2). 1500 m: 1 Yang Weize (83) 3:41.27; 2 Dou Zhaobo (83) 3:44.01; 3 Xing Shuai 3:44.08. 10,,000 m: 1 Gong Ke 28:59.21; 2 Zhao Haijun 29:05.65; 3 Liu Huyuan 29:11.19. Marathon (14 October, Beijing International Marathon): 1 Gong Ke 2:10:11; 2 Li Aiguo 2:10:25; 3 Wang Yonghua 2:10:26. 3000 m steeple: 1 Sun Wenli 8:36.25; 2 Sun Jiawei 8:38.85; 3 Niu Xueren 8:40.02; 4 Guo Jian 8:41.40. 110 m hurdles (+0.4): 1 Liu Xiang (83) 13.36; 2 Chen Yanhao 13.42; 3 Shi Dongpeng (84) 13.49; 4 Qi Zhen 13.70; 5 Cao Jing 13.83; 6 Zhang Feng 13.84. High jump: 1 Wang Zhouzhou 2.24; 2 Zhou Zhongge 2.24; 3 Liang Tong 2.24;. 4 Liu Jianmin 2.21; 5 Tao Rui 2.21. Pole vault: 1 Wu Yun 5.30; 2 Chen Zhong 5.20; 3 Liu Yingman 5.20. Long jump: 1 Li Dalong 7.95 (-1.1); 2 Huang Le 7.88 (-0.8); 3 Lao Jianfeng 7.86 (-1.4); 4 Wang Cheng 7.82 (-1.8). Hammer: 1 Ye Kuigang 73.04; 2 Liu Fuxiang 68.45; 3 Bi Zhong 67.40. Javelin: 1 Li Rongxiang 81.15; 2 Zhang Lianbiao 80.72; 3 Sun Shipeng 78.51; 4 Gao Wenxu 76.46; 5 Chen Qi (82) 76.30; 6 Zhang Houxi 74.11. 20 km walk: 1 Li Zewen 1:20:49; 2 Pei Chuang 1:20:58; 3 Yu Chaohong 1:21:04; 4 He Xiaodong 1:21:37; 5 Zhu Hongjun (83) 1:21:58; 6 Bai Liansheng 1:22:16; 7 Yu Guohui 1:23:18; 8 Chang Chunhu (82) 1:23:44; 9 Liu Dashan 1:23:48; 10 Xu Xingde (84) 1:24:32. 100 m (+0.9): 1 Li Xuemei 11.14; 2 Liu Xiaomei 11.22; 3 Chen Yueqin 11.42; 4 Zeng Xiujun 11.43; 5 Zou Hua 11.46; 6 Ni Xiaoli 11.58; 7 Li Yali 11.59, Semifinals, Heat 1 (+0.8): 1 Liu Xiaomei 11.34; 2 Chen Yueqin 11.37; 3 Li Yali 11.55, Heat 2 (-0.2): 1 Li Xuemei 11.22; 2 Zeng Xiujun 11.44; 3 Huang Mei 11.52; 4 Ni Xiaoli 11.55, Heats, Heat 1 (+1.1): 1 Liu Xiaomei 11.27; 2 Chen Yueqin 11.40, Heat 2 (+0.4): 1 Li Xuemei 11.31; 2 Liang Yi 11.59, Heat 3 (+1.0): 1 Zou Hua 11.52; 2 Huang Mei 11.56, Heat 4 (+1.3): 1 Zeng Xiujun 11.44; 2 Ni Xiaoli 11.56; 3 Li Yali 11.56. 400 m: Bu Fanfang 51.35; 2 Chen Yuxiang 51.40; 3 Zhong Shaoting 52.24; 4 Zhang Hengyun 52.44; 5 Yan Jiankui 52.44; 6 Gao Lihua (84) 52.61; 7 Zhou Wei (82) 53.50, Heats, Heat 1: Chen Yuxiang 52.22; 2 Xiao Hongfan (83) 52.94; 3 Zhou Wei (82) 53.02; 4 Zhai Lin (83) 53.38; 5 Zhang Henghua 53.48, Heat 2: 1 Bu Fanfang 52.08; 2 Zhong Shaoting 52.85, Heat 3: 1 Zhang Hengyun 52.53; 2 Gao Lihua (84) 52.72; 3 Yan Jiankui 52.79; 4 Xiang Chirong 53.08. 1500 m: 1 Lin Na 4:07.06; 2 Liu Xiaoping 4:07.31; 3 Dong Yanmei 4:07.72; 4 Yan Wei 4:08.05; 5 Zhang Jinqing 4:08.09; 6 Sun Qiuhong 4:08.12; 7 Xing Huina (84) 4:11.58; 8 Wang Chunmei 4:11.83; 9 Guo Lingling (86) 4:13.09, Heats, Heat 1: 1 Xing Huina (84) 4:10.43; 2 Liu Xiaoping 4:10.56; 3 Wang Chunmei 4:10.61; 4 Zhang Jinqing 4:10.63; 5 Shi Hua 4:10.83; 6 Dai Yanyan 4:12.11; 7 Tong Dejing 4:15.37, Heat 2: 1 Yan Wei 4:14.00; 2 Guo Lingling (86) 4:14.01; 3 Dong Yanmei 4:14.02; 4 Lin Na 4:14.04; 5 Sun Qiuhong 4:14.12. 10,000 m: 1 Dong Yanmei 31:43.59; 2 Sun Yingjie 31:49.47; 3 Liu Min (83) 31:53.78; 4 Wei Yanan 31:54.86; 5 Ren Xiujuan 32:07.55; 6 Ju Limei 32:14.14; 7 Zhang Yang (83) 32:20.48; 8 Dai Yanyan 32:28.35; 9 Zhang Yuhong (83) 32:23.62; 10 Wang Xiaoming (85) 32:33.00; 11 Li Meihua 32:33.69; 12 Sun Rong (85) 32:36.19; 13 Li Helan 32:38.02; 14 Lu Jingbo 33:00.59; 15 Sun Wenqin 33:24.24; 16 Chan-Ropper Man Yee HKG 33:25.14. 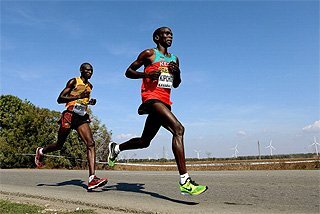 Marathon (14 October, Beijing International Marathon): 1 Liu Min (83) 2:23:37 National Record, World Junior Record; 2 Wei Yanan 2:24:02; 3 Ren Xiujuan 2:24:22; 4 Dai Yanyan 2:24:41; 5 Zhang Shujing 2:24:42; 6 Jin Li (83) 2:25:48; 7 Zheng Guixia 2:25:55; 8 Lu Jingbo 2:28:00; 9 Zhao Shengzhi 2:29:03; 10 Sun Yingjie 2:29:16; 11 Ju Limei 2:30:22; 12 Wang Yanrong 2:30:25; 13 Tian Mei 2:30:35; 14 Li Helan 2:35:21; 15 Zhao Yanyan 2:35:30. 100 m hurdles (+2.2): 1 Su Yiping 12.70w; 2 Feng Yun 12.86w; 3 Zeng Xiaoling 12.91w; 4 Zhang Yu 13.03w; 5 Pang Meijuan (82) 13.13w; 6 Xiong Yanling 13.16w; 7 Zhu Shuiying 13.36w; 8 Zeng Yan 13.37w, Heats, Heat 1 (+1.4): 1 Feng Yun 12.93; 2 Zhang Yu 13.29; 3 Zeng Xiaoling 13.31; 4 Zeng Yan 13.35; 5 Xu Jia 13.43, Heat 2 (+0.5): 1 Su Yiping 13.03; 2 Zhu Shuiying 13.46; 3 Tan Yali 13.46, Heat 3 (+1.1): 1 Xiong Yanling 13.29; 2 Pang Meijuan (82) 13.36; 3 Deng Xiaocen 13.40; 4 Han Chunping 13.49. Long jump: 1 Gu Ying 6.57 (-0.7); 2 Zhu Yanyan 6.53 (-2.1); 3 Wang Lina (83) 6.51 (-1.9). Discus: 1 Song Aimin 62.34; 2 Ma Shuli 62.21; 3 Luan Zhili 62.20; 4 Xiao Yanling 61.81; 5 Li Yanfeng 61.77; 6 Qin Lei 60.09; 7 Xu Shaoyang (83) 59.97; 8 Liu Yanxia 59.89; 9 Ma Xuejun (85) 58.65; 10 Cao Qi 58.01; 11 Chang Xinhong 56.25; 12 Hu Honglian 55.79; 13 Chou Ying 54.87; 14 Cao Liping 54.01; 15 Wang Pingping 53.36.